(AP) TOULOUSE, France - A gunman who had past psychiatric problems took four people hostage Wednesday in a bank in Toulouse, claiming he was acting for religious reasons, then was captured in a police raid about six hours later, authorities said. The hostages were released unharmed, and the hostage-taker was lightly injured, regional police official Frederic Tamisier said. Another police official said he was hurt in the leg, though the cause of the injury was unclear. Gunshots were heard from the site around the time the gunman was captured. The incident plunged this city in fear for the second time in recent months. Tensions have been high in Toulouse since March, when a gunman who police said claimed links to al Qaeda killed three Jewish schoolchildren, a rabbi and three paratroopers in the area. Those were France's worst terrorist attacks in years, and led to a crackdown on suspected Islamist radicals around France. In Wednesday's incident, a man with a firearm entered a CIC bank branch in central Toulouse at about 11 a.m. (5 a.m. ET) and took the bank director and three other bank employees hostage, police officials said. Authorities started negotiations with the gunman, and he released one hostage mid-afternoon, a woman in her late 20s who was feeling ill, a police union official said. Toulouse Mayor Pierre Cohen said the gunman had been known to authorities for having psychiatric problems. French Prosecutor Michel Valet said that during negotiations, the gunman said he wanted to advertise the religious motivation behind his act. "The hostage-taker ... wants us to make it known that he is acting not for money, and that his motivations come from his religious conviction," Valet told reporters at the scene. He did not say what faith the gunman adheres to. French media reports say the gunman is claiming allegiance to al Qaeda. Police officials who spoke to The Associated Press could not confirm this claim. Prosecutors dismissed any al Qaeda connection to the gunman. "I am not a doctor," said Valet, "but we have objective elements that allow us to think and affirm that we're dealing with someone who suffers from considerable psychological problems and that his act is linked to these problems." The neighborhood around the bank was cordoned off, and neighboring buildings were evacuated. Officers from GIPN specialized police units were brought to the scene from Bordeaux and Marseille. The bank is in the same neighborhood where Mohamed Merah, the suspected gunman in the March attacks, was shot and killed by police. It is near the police station where authorities were overseeing the operation to surround and negotiate with Merah. The mother of a child evacuated from a neighborhood school said on RTL radio that she had received a text message in the morning saying the CIC bank was being robbed. Doriane Clermont, 23, lives across the street from the bank with her 3-year-old son  and said she's "thinking of moving." "I'm worried about the climate that reigns in this city," she said, waiting behind the police barrier to be able to return home after she was evacuated. Resident Maria Gomes was similarly unsettled. "We were walking when we heard great agitation in the neighborhood, with police cars," she said. "Fear is coming back, after the Merah affair." Among those evacuated were 4-year-olds and 5-year-olds from a private language school next to the bank. Valerie Ruckly-Gravier, who heads the Happy Momes school, or Happy Kids, said police advised that the security parameters in place could last throughout the day. The Paris headquarters of cooperative bank CIC was in contact with police in Toulouse, bank spokesman Bruno Brouchiquan said. The bank describes itself as the second-largest retail bank in France and the leading bank insurance group, with thousands of branches in France and around the world. The hostage-taker said he wanted the elite RAID national police force to come negotiate with him, police said. 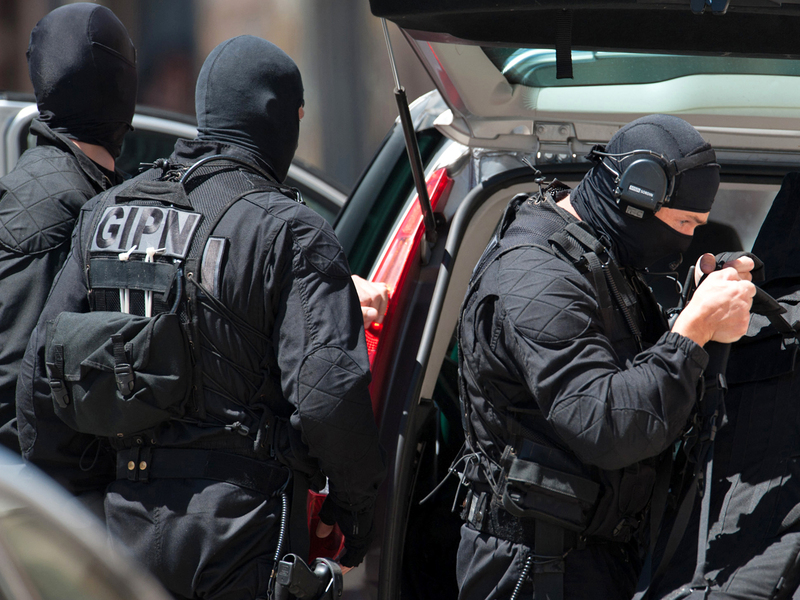 The RAID police force led negotiations and a 32-hour standoff with Merah, a Frenchman of Algerian origin, in his Toulouse apartment. Merah was shot in the head in a gunfight at the end of the standoff. French authorities described Merah as an Islamic radical who had trained in Afghanistan and Pakistan. French intelligence officials said at the time that they found no operational ties between Merah and al Qaeda despite his claim. His brother is in custody after being handed preliminary charges of complicity to plotting the killings at a Jewish school in Toulouse and of paratroopers in Toulouse and nearby Montauban. While there was no sign that Wednesday's hostage-taker in Toulouse had links to terrorism, it came amid heightened concerns in France about homegrown radicals following the Merah affair. Pakistan announced Wednesday that authorities have arrested a Frenchman reportedly linked to one of the masterminds of the Sept. 11 terrorist attack.